Galltec+Mela offer a wide range of measurement and control instruments for humidity and temperature for a wide range of applications: hygrostats and humidity and temperature sensors with the classic Polyga® humidity measuring element, or sensors with the capacitive Mela® sensor element, sensors with a digital Plug-and-Measure-Unit which can be directly calibrated, controllers and always suitable accessories. Developed by dedicated employees and produced in accordance with DIN EN ISO 9001, our products are sold all across Germany, Europe and worldwide at attractive prices. Galltec starts up - then known as "Gebrüder Gall" - in Esslingen, Baden-Württemberg, producing Polyga® humidity sensors and hygrostats. Due to continuous expansion, a new production and administration building is built (today the administration and development headquarters). Galltec expands even further: new workshops increase production facitities. The premises for development, the EMC lab and sales were also extended to meet market requirements. Galltec becomes a majority shareholder in MELA Sensortechnik GmbH. The two companies complement each other perfectly. Development and production of the two measuring principles (hygrometric and capacitive) now come from a single source: A high benefit for inovation which aims to a high customer's benefit. Inauguration of the new building of MELA Sensortechnik GmbH in Mohlsdorf, Thüringen. 35th anniversary of the foundation of Galltec. 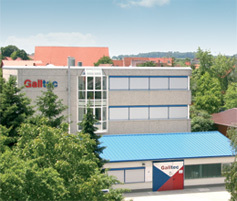 40th anniversary of the foundation of Galltec. Galltec®+Mela® are known for the quality and reliability of their products which are successfully sold all around the world.